Endurance Events – Adventure Awaits! It’s the beginning of the year, so it’s time to start thinking about what events and races I’ll want to do this year. I love endurance events; I enjoy the challenge of a ride or race that takes all day, see just how far I can push myself. I’ve got a few I already know I will register for, as well as searching out some new adventures. Since I’m in the process of scheduling the endurance events I’ll be doing this year, I thought I’d blog about some of my past experiences and give what tips and advice I can offer. I hope you’ll join me out on some of these adventures! 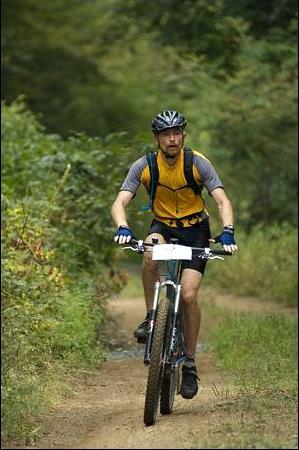 My first endurance race was a mountain bike race called the Jay Challenge in 2004. It was a 62 mile race up, over, and around Jay Peak in Vermont with 11,000 feet of elevation gain. I had NO idea what I was getting into, but it sounded like fun! Here’s are my first two pieces of advice if you are thinking about doing an endurance event for the first time: 1. sign up early. This is good for several reasons. It gets you excited because you’re committed. It’s also usually cheaper the earlier you sign up; many races/events raise the price as it gets closer to the event. And, since you are committed already, it encourages you to actually train for the event. Don’t say to yourself, “I’ll see how the season is going and if I feel up to it, I’ll register later.” No, no, no! Sign up early, train, and you WILL feel up to it! 2. Train for the event. Learn the particulars of the event: miles, elevation change, terrain, average weather for that time of year at that location. I did the first well; I registered for the race probably 6 months before the start. I did the second rather poorly. I had no idea what to expect for an endurance race, and put in minimal effort to find out. I did some bike riding, of course, but really not more than normal, and I did not seek out rides with the kind of elevation gain the event would have. My longest ride before the event was about 30 miles with maybe 1,000 feet of elevation gain. That first race, the Jay Challenge was great fun, but brutal. I managed to finish, but I was the last one over the line 10 hours and 58 minutes after the start. I was walking every uphill less than halfway through the race. I was getting to the aid stations as they were already starting to put things away. I was wiped out. I actually had to walk across the finish line because it was up a small hill to get to it. But, I still enjoyed it because I learned about what I was capable of, and I found a group of people around my ability to ride with and we had a good time encouraging each other on. Four of us crossed the line together (well, I was a few seconds back since I walked that last incline). So, when you go to an event, don’t worry if you don’t know anyone else going, you’ll naturally fall in with other people about your same strength and skill and be able to share the experience with. It was a few years before my next endurance race, the Shenandoah 100 in 2007. 100 miles with 12,000 feet of elevation gain over tough and gnarly terrain. I signed up early, and took notes from the lesson I learned about finding out what you are getting into. I had ridden some of the trails in the area, and I spent some time actually training for the event. I had a goal of 14 hours or less (my first race I didn’t have a goal, just to do it). I recommend giving yourself some sort of goal: a time, a percentage to land in among the finishers, something to strive for. It makes it more fun pushes you on. I rode a rigid steel singlespeed in that Shen 100. I remember wondering if I could make my goal 75 miles into the race. When I got to the aid station at mile 88, I realized I could still finish under 14 if I managed to pedal up the last climb and not do any walking. I was standing on the pedals, just mashing them one pedal stroke at a time, but I made it up the last climb, then sailed the last few miles to the finish, ending with 13:36, crushing my goal! A broken wrist didn’t stop me from riding a century in the Garret County Gran Fondo in 2011! 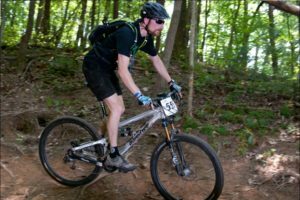 Since then, I’ve done numerous endurance events: mountain biking, road biking, gravel grinding, even a 185 mile trek on the C&O Canal towpath. Each of them has had their own adventure, challenges, and rewards. I’ll highlight a few more that will give you some guidance on what to do and not do in an endurance event. The biggest challenge to an endurance event is mental. You have to mentally prepare yourself to commit to finishing the event and accomplishing your goal. And if you find yourself falling short of your goal, it’s easy to get discouraged. But, remember, it’s about the fun and the challenge. The goal is important to make, but not always important to actually accomplish. During these events, at some point you will likely find yourself second-guessing yourself and considering dropping out; most everyone does! Case in point: the Shenandoah 100 last year. I had a goal to finish under 10 hours. For the first half of the race I was riding strong, on target to meet the goal. However, I got my nutrition wrong and bonked 60 miles in. It got tough to even turn the pedals, and realized I was not going to make the goal time. But, nothing actually hurt, I was just really tired and lacking energy from not eating enough early in the race. But I committed to just enjoying the rest of the ride and not worry about the time. I ate some more and tried to recover a bit. I still had a blast even though I finished in 11:30. Stick it out through your first endurance event and you will be proud of yourself. Quit, and you’ll be mad at yourself. Having just said that, know when to quit! If something really hurts, quit. You crash and get injured, it’s not always best to demonstrate your toughness. A couple of years ago I did the Wilderness 101, another 100 mile mountain bike race. I was going great, feeling really strong. I was setting a really good pace, well on the way to my sub-10 hour goal. Well, I had been a little sick a couple days before. Even though I felt great on the day of the race, I ended up experiencing some ill effects. Namely, I started getting really bad cramps in my legs at the 60 mile point. I still had plenty of energy, but couldn’t really push it on the climbs without my legs locking up from cramps. Being the hard-head I am, I pushed on, and actually managed to finish in 10:07, just missing my goal. I figure the cramps cost me about an hour, though. In and of itself, not so bad it would seem having pushed on and finished, right? Well, my legs hurt from the cramps, not the racing, for 3-4 weeks after that! If I was smarter, I would have quit, because the cramps ended up causing me to not be able to train as well for events I had registered for later in the season. Another time I rode the Alpine Loop Gran Fondo with not enough training and maybe some underlying cold or something I wasn’t aware of. 88 miles in to the 107 mile ride, my friend and I realized we could still make the 10 hour cutoff for the bells. I was starting to not feel great, but hammered the last 19 miles, anyway; absolutely hammered them. We just made it, but I had done too much. Caused myself an electrolyte imbalance and was sick for at least a week. I may have been ok had I not pushed so hard at the end, but I probably should have pulled out at 88 miles. Some of the issues I’ve described can be helped with proper nutrition. I still work to figure out exactly what the right nutritional plan should be for a race. Sometimes I get it right and feel great the whole ride. Other times I get it wrong and end up bonking. Be sure to experiment with what works for you BEFORE the event. I think I’ve finally got a decent handle on it, but I also find it different now than I did 10 years ago, so it’s a continual process (I seem to need to eat more now than I did years ago). Supplements can help; I like to use Endurolytes to help ward off cramping and Sports Legs to help with soreness. Some people can subsist on gels for the entire race, others need solid food. Obviously, be sure to drink enough water, especially if it’s hot. 20-30 ounces of water every hour during the summer is what most people will need, and about 200-300 calories each hour, mostly from carbs. Now, don’t let a few of my horror stories scare you off! I’ve got plenty of great stories, too, like the 2009 Shenandoah 100. My goal was under 12 hours, hoping to break 11 even. I got everything right, and I sailed through with a time of 10:34. 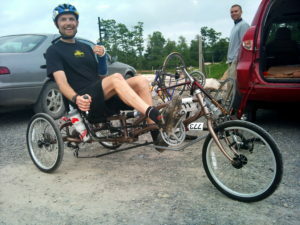 I did the Gravel Race Up Spruce Knob a couple years ago, and finished 6th in my class, which for me was a super result. So, if you’re considering an endurance event this year, don’t put it off! If you weren’t considering an endurance event this year, consider doing one! If you want help with planning, training, nutrition, or just to share stories about endurance events, stop on in! We have all the elements for your next great adventure! Now, Get Out! Have Fun!